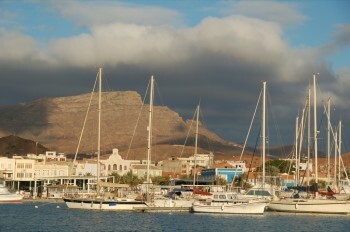 The waterfront in Mindelo is dominated by a new, foreign-owned marina. 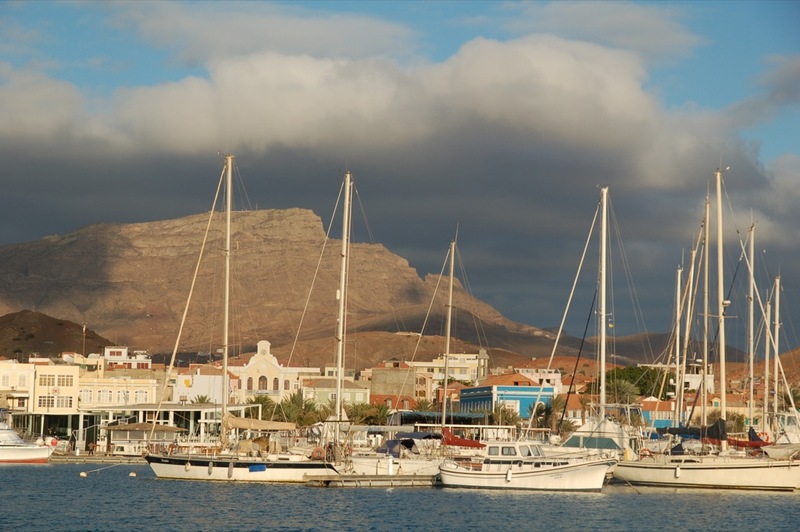 So far as visiting yachtsmen are concerned the biggest change to Mindelo, in the past few years, is the construction of a marina. This affair completely dominates the waterfront. Once there was a quay here, and the packet boats used to berth on the far end and disgorge their passengers. More recently the quay had fallen into disrepair and the area was used by the fishermen, passing to and from the beach. 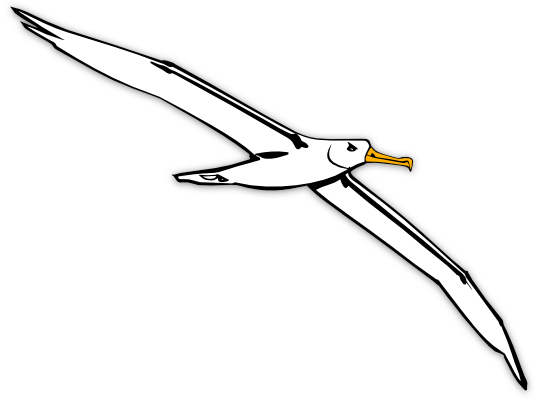 The area immediately to west made an excellent anchorage. Now, the whole area is covered in a framework of floating pontoons, and yachtsmen who don’t wish to fork out the necessary berthing fee must find space as best they can. We can either squeeze into the narrow gap twixt the marina and the commercial port or – if this small space is already full – we must anchor far from the beach in the waters beyond the marina. Meanwhile, the view from the town is no longer of sunshine dancing on the blue waters of the bay and of the mountain on the far side. The view is of concrete and white paint. To be fair, the marina is not the only new construction on the waterfront. Adjoining it is a startlingly modern restaurant complex built of tinted glass and more concrete. Local people told us that they don’t expect for it to survive the first flash-floods, which bring cobblestones and rubbish – and cars, too, sometimes, we were told – all tumbling down the old main street and into the sea opposite. The new bar and restaurant complex, with its plate glass windows, is directly in the line of fire. Certainly, this modern structure seems most unlikely to survive for even half as long as the quaint and colourful houses on the far side of the road. But then, it wasn’t built to last; it was built to make somebody rich. 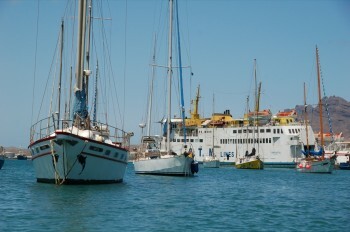 Anchoristas must now squeeze into the space between the marina and the commercial port. Whether you rate the marina as an improvement or a detraction will depend largely on whether you want to use it or not. For those of us who like the privacy and economy of lying to our own hook, it’s a bit of a nuisance – but one would not mind this fact so much if it were owned and operated by the Cape Verdean government; and one would not mind it so much if the management had a live and let live attitude. As it is, the marina belongs to a German duo, and the main man and his principal employees have a very antagonistic attitude towards yachtsmen who don’t wish to use their facilities. Essentially, one gets the impression that Herr Brossman would like to force us out of the harbour; or – better still – into the marina. 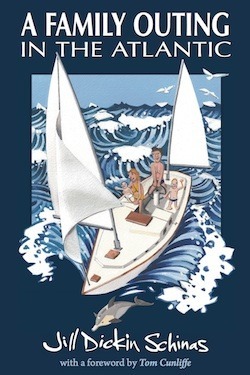 When we tied our dinghy to a friend’s boat, while paying him a brief visit, and declined to pay this fee, the furher’s chief henchman became almost apoplectic about our “abuse of the facilities” and threatened to call the police! With the exception of this one individual the marina staff are very pleasant. 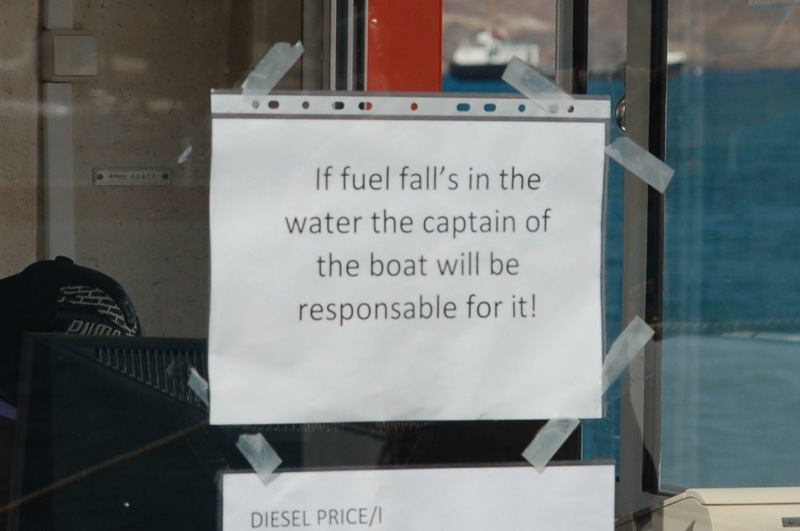 One of them was so helpful as to warn us that if we left our dinghy on the adjacent beach, rather than pay for the privilege of using the marina dock, then his boss would come along and set it adrift… however, this did not happen. We left our dinghy on the beach every day and on many evenings throughout our month-long stay here, and no one molested it. 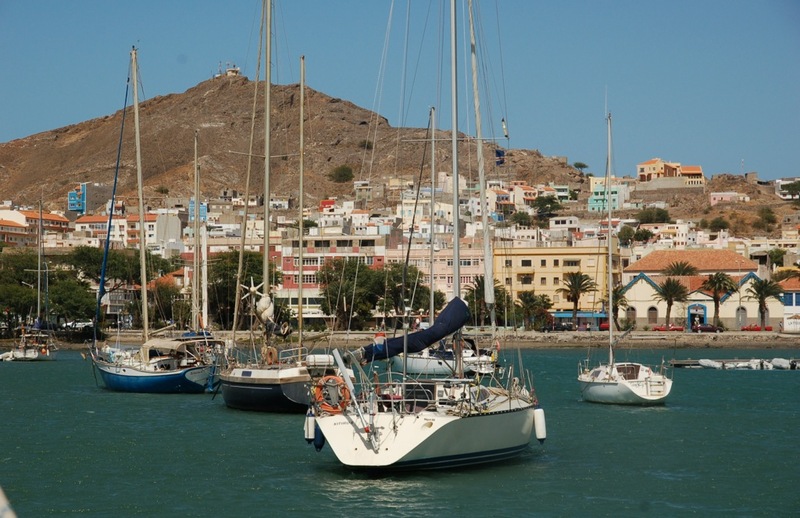 Praia may have managed to hang onto the title and kept its role as the business centre of the Cape Verdes but Mindelo is, without a doubt, the cultural capital. Indeed, it is the only place where you will come across musicians jamming together in a bar or find paintings done by local artists. The influence of the founding fathers of this small city is still strong, it seems. Whereas the lifestyle of the peasant fishermen and farmers reflects both their European and their African origins, the Mindelense are Afro-European only in appearance; in every other way they look to Europe alone for their inspiration. Bearing this in mind one is not too surprised to find that the music coming out of Mindelo is all European in style. The most famous genre is morna – exquisitely sad but still rhythmic – and the finest and most famous exponent of this was the late Cesaria Evora. Cesaria Evora’s house was just along from the palace, heading left out of the photo. 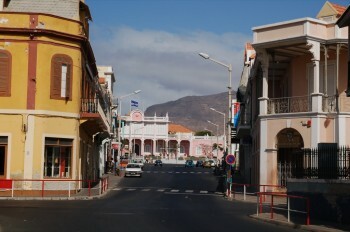 Senhora Evora was born in Mindelo and, when she was not on tour, still lived in the centre of town in a house close by the President’s Palace. Being very partial to a drop of Santo Antão grogue she was often to be found in the bar next door rather than in her own house, or so ‘tis said. We were also told that she welcomed visits from passing musicians – but since we cannot be counted among that number we never tested her hospitality. 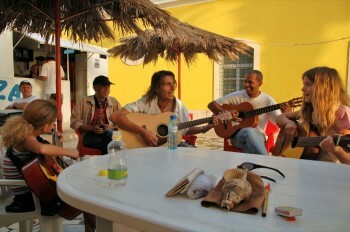 During our visit to Mindelo Cesaria gave an impromptu concert in a small converted warehouse on the seafront. Six months later she was dead. Her last few hours were spent drinking and smoking with her friends – and that, I am sure, is the way she would have wanted things to be. Cesaria was the first Cabo Verdian artist to receive international acclaim, but nowadays there are a number of others who have made the grade – including Lobos de Mar and his nephew, Mirri Lobos (who hails from Sal). In Mindelo there are also plenty of musicians whose preference is for more cosmopolitan styles, such as classical and jazz. Teck is a well-travelled and worldly wise Cabo Verdian who has spent much of his life in the merchant navy and a fair part in China and Brazil. He is now back home in Mindelo and can often be found, on a Friday night, doing the thing he likes best: playing his soprano sax at Jazzy Bird, a bar near to the praҫa. Hilario is a violin teacher and classical guitarist whose family were responsible for the inaugauration of Cape Verde’s finest cultural event: the Baia dos Gatas Music festival held every August in São Vicente. 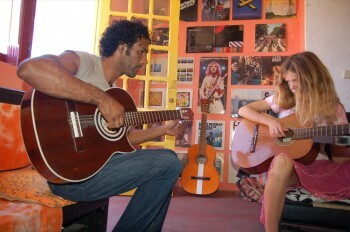 Hilario has recently opened a new bar – Galeria Apeiron – where local musicians often get together and do their thing. Whilst the other islands do also produce their own musicians, the people of São Vicente are the only ones to take any great interest in their history and ancestry. Of course, people never do take much interest in their past until they have pretty much lost it. Until they have climbed up out of the muddy pit and risen to the surface they are too busy scraping a living to take a look at life. Then, when they look back, that mire begins to seem picturesque. So it is for the Mindelense. 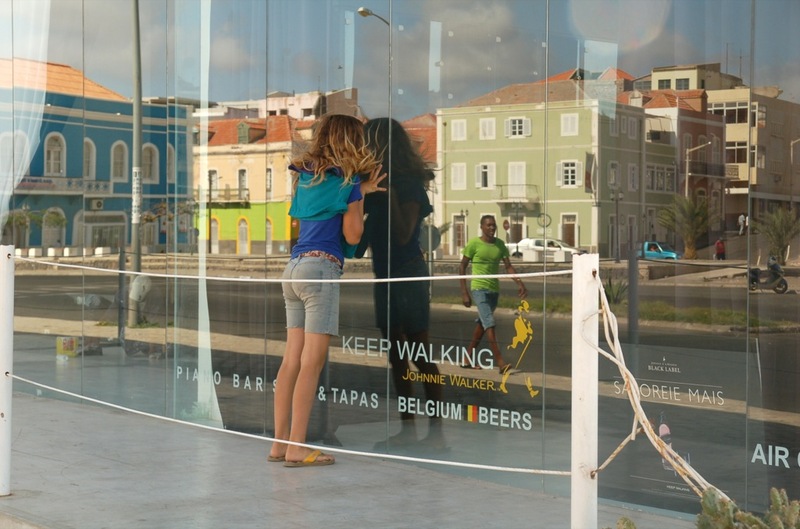 Alone, of the Cape Verdeans, they have escaped from the drudgery of living hand to mouth – off the land, or from the sea – and they alone look back from their position of ease and relative affluence and think about slavery. 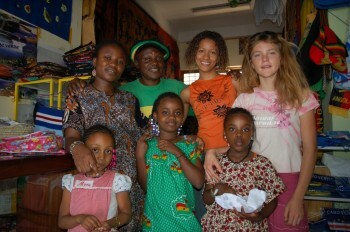 A small Cultural Centre occupies a building at one end of the praҫa (or town square), and here the people seek to recover the skills of their African ancestors. 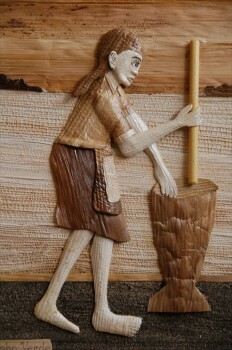 Hand-woven cloth is one product of this endeavour. It is not to the same high standard as the cloth produced on the continent, in Guinea Bissau, and it is very expensive; but you don’t have to pay to have a look. If you are interested in things African then be sure also to pay a visit to one of the souvenir shops in the vicinity of the square. These both belong to one man – David Kwame Amoako – whom we first met here in Mindelo 17 years ago. At that time David was newly arrived from Ghana and was selling souvenirs in the Praҫa Estrela, at the opposite end of town. He charmed us with his enthusiasm and his smile, and I had often wondered what became of him. 17 years afterwards, on our latest visit to the town, we wanted to buy a T-shirt featuring Amilcar Cabral. The shop by the main praҫa stocked the best ones, and so we wandered in. After that it was impossible for us to buy anything from his shop without David halving the price. He actually had a photo of our kids, in their infancy, tucked away in his desk! If you’re in Mindelo and you want an Asante stool, or a Senegalese djembe, or a mask, or a Bob Marley T-shirt… then David Amoako is your man. Married now, to a Cape Verdian craftswoman, he also sells local artefacts such as traditional banana-leaf collages and the aforementioned hand-woven cloth. Clearance procedures and security having being discussed elsewhere, it remains only for us to describe the facilities. As we have seen, the anchorage has been pretty much elbowed aside by the marina, but there is still a little slice of open water left to us between the jetties and the commercial port. This area is cramped, but since the wind is almost always blowing down from the mountains – and blowing with quite some force at times – it is possible to lie quite close to your neighbours without coming to grief. The holding is good but the water is shallow. When the tradewind is pumping and those hills have added their influence things can get quite lively, and without the room to pay out more chain you may find that you need to put out a second anchor. 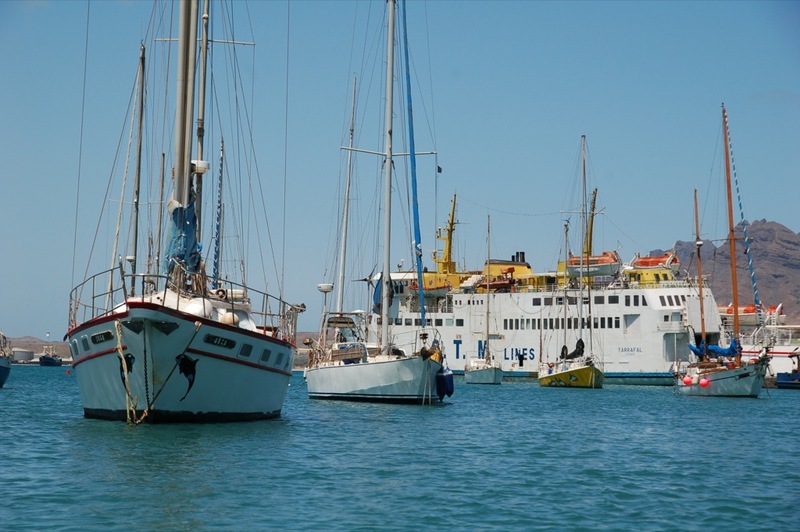 If the area between the port and the marina is full then you will need to anchor further out. Whatever you do, don’t get too close to the end of the wharf where the ferries berth. The weekly ferry from Praia uses the marina-side of this wall, and as it makes its turn it drops an anchor right there, where you were thinking of putting yours….. Local legend has it that the ferry once dropped its hook right on top of a yacht which was in the wrong place, causing a great deal of damage. 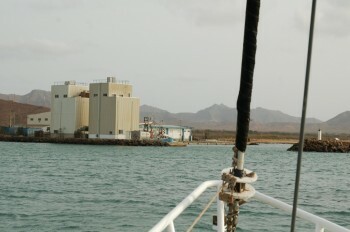 Water is available from the marina, but they keep it stored in a reservoir. If the tank has just been filled then it tastes fine, but if it has been sitting there for weeks then it is fairly nasty. So taste first before you fill up. The cost, as I recall it, is €1 per jerrycan. You can also take on water in the new fishermen’s port on the far side of the bay. The cost is the same. No appointment is necessary, and the men will be delighted to see you. 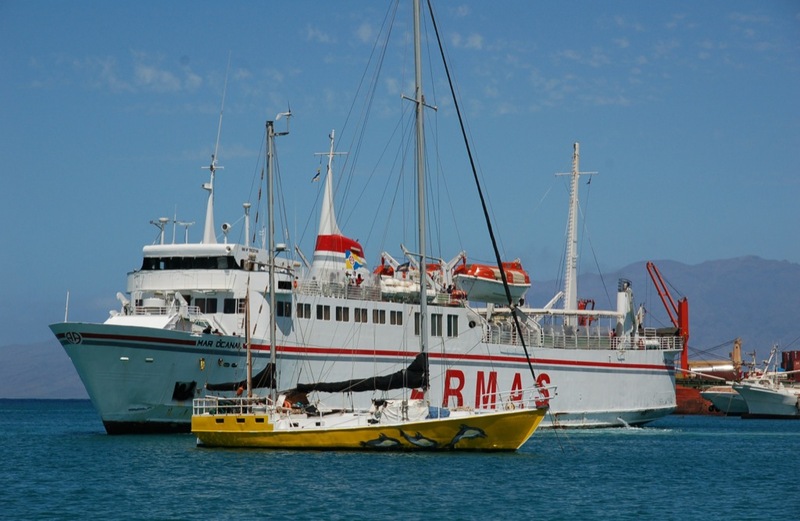 You may have to berth alongside a fishing boat. Try to accept this in a positive frame of mind: it’s all part of the cultural experience of cruising. 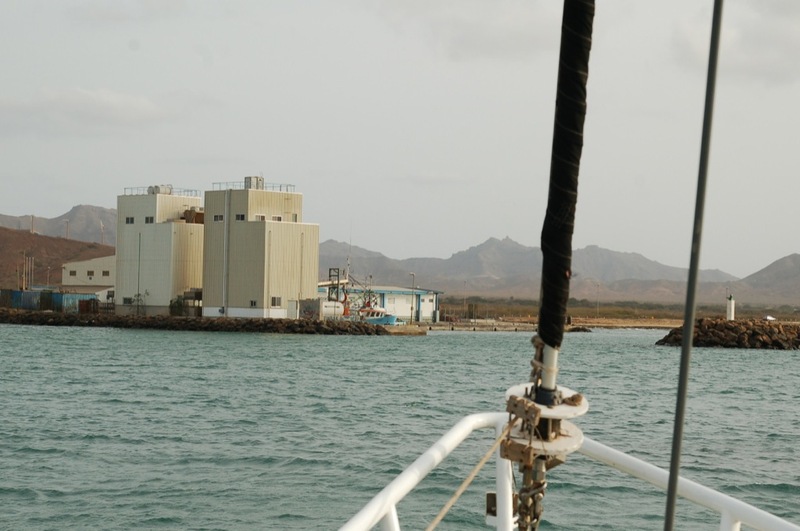 If you want to be sure of taking on pristine water freshly minted in the desalination plant, phone for a tanker (or stop one in the street) and arrange a meeting in the commercial port, on the far side of the wall from the anchorage. A ton of water delivered by the tanker costs half as much as the water available via the marina or the fishing port. If my memory serves me correctly it was €25. Alternatively – if all you need is a few jerrycans of water – you can use the stand-pipe on the seafront on the far side of town (opposite the port). This is probably the most tiresome option, but it’s also the cheapest: 25 cents per jerrycan. The marina will not fill jerrycans. If you want to take on fuel here you will need to bring your boat alongside. If you want to fill jerries take them to the garage on the seafront, just beyond the marina. The Shell depot on the far side of the bay can fill French bottles – although it took a bit of arm-twisting to persuade them to do so. They also sell Camping Gas. The marina keep their bins locked…. 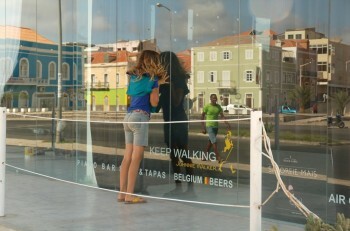 There are others just beyond the flashy new waterfront bar-complex, close to the petrol station (garage). On the far side of the road opposite the beach (at the head of the anchorage) stands a small group of buildings which were once associated with the port. The one nearest to the marina is the old customs house. It is now an arts centre. The building adjacent to the arts centre used to be a warehouse. It has two entrances. 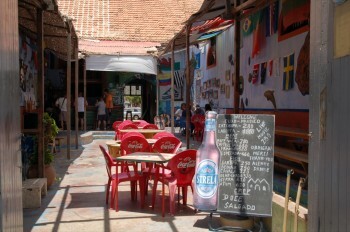 On the far left, facing the square, we find a doorway which leads into the local capoeira club. This meets every other day, at about eight in the evening, and visitors are very welcome. Indeed, there seems to be quite a tradition of yotties joining in. You don’t have to know what you are doing. You don’t even have to have seen capoeira before. Just listen out for the drums, walk through the door… and pretty soon those ever-friendly Cape Verdeans will have you dancing the djinga along with them and kicking your legs high. When the capoeira session is over and it’s time for a rest you can pop next door and have a beer and a meal in the Club Nautico. There are only about two resident yotties in Mindelo, so it isn’t really a yacht club, of course, but this place has set itself up as the social centre for the cruising crowd, and this is where everyone goes. The beer is a little bit more expensive here than in any other bar… but the food is good and so is the ambience. The music is terrible. Squeezed between the two buildings, in a caravan parked on the pavement, we find Christian’s pizzeria. Since we prefer to eat local food we by-passed this place many times before we eventually discovered that the beer is cheap, the pizzas are hand-made, and Christian is a lovely fellow with a lovely wife and lovely kids. Having spent much of his childhood in Senegal and in Europe, Christian speaks perfect French and good English. 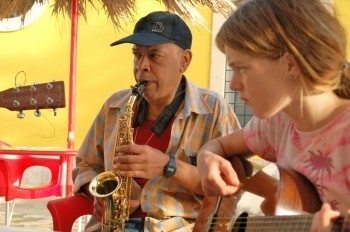 He also plays guitar and djembe – so this is another good place for a jam. There are several small supermarkets and lojas. One of the least worst is in the cobbled street which leads from the church to Praҫa Estrela. Prices are much higher than in the Canaries. There are three vegetable markets. Many yotties manage to overlook the main one. It stands in the high street (which leads from the waterfront towards the pink palacio) but it is so grand that one can easily mistake it for a government building – although it is clearly labelled. I’ve come to the conclusion that the year that we spent in the Cape Verdes (’94 – ’95) must have been a period of drought. No rain fell on São Vicente, hardly any fell anywhere else, and there was little available in the way of vegetable produce. 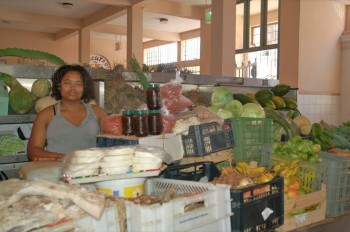 On our more recent visits there has been plenty of good quality fruit and veg both in Mindelo and in Praia. 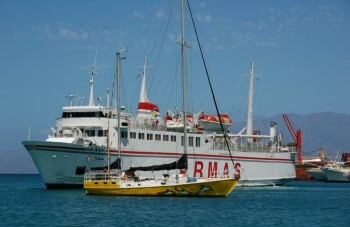 Sailors interested in perpetuating the tradition of the sea will also want to stock up on the local grogue (rum). Come to that, one can also buy ship’s biscuits (bolachas) – which are tough but quite satisfying – and salted pork… which probably isn’t. Buy the meat, if you wish, from the market, the biscuits from the bakers (near to the church), and the grogue from a bar called Tuberon, which is close to the miniature Torre Belem (the toy castle on the foreshore). Fishermen with a hammerhead shark. They caught it on a line and stabbed it to death. Just beyond the Torre Belem (a replica of the one in Lisbon) one finds the fish market. This is an interesting place to wander round even if you don’t want to buy anything. 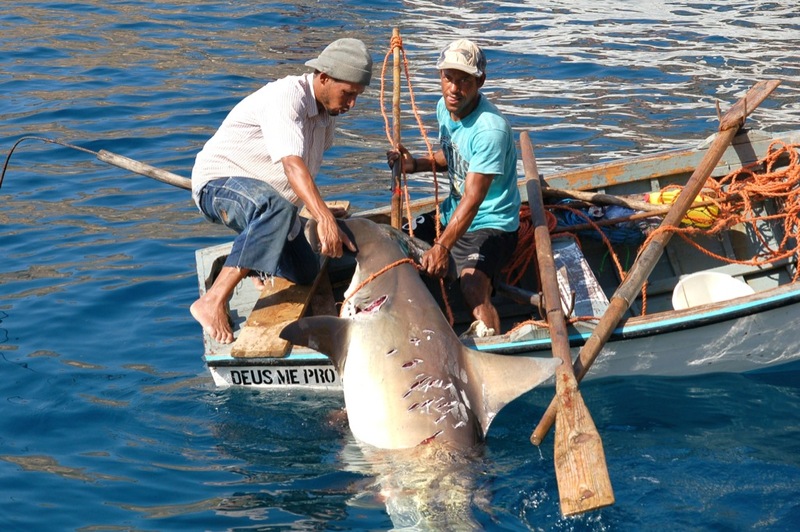 The fish are all caught by traditional, subsistence methods using either a hand line (in the case of the tuna and other big fish) or a net spread from a small boat or from the beach. Prices are very good. Cheapest of all are the cavalha and similar small silvery fish. There’s no refrigeration here so be sure to buy them very fresh, or else you risk a dose of scombroid fish poisoning. There’s bound to be some tuna on offer too, but if variety is the name of your game how about trying something different. How about salted shark? Or how about percebes? Percebes are goose barnacles, exactly like the ones which grow on the bottom of your boat, and they taste like little bits of seaweed-flavoured rubber…. Wonderful article ! 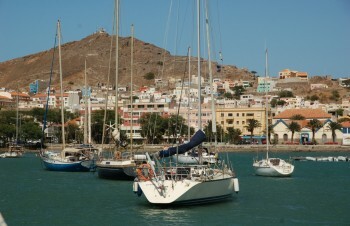 We loved Mindelo but could only stay for two weeks. The dinghy-story in the marina happened to us in an identical way, we loved to hang out at the Club Nautico and to shop at the market. 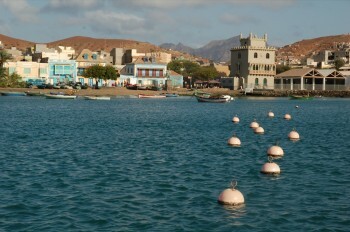 I wish there was an easier way back, I’d love to spend some more months in Cabo Verde. Have fun in Argentina !!! Well how are you all? Tommy is sailing to Cape Verde on a yacht, I thought I would google the islands as he is due to arrive there anytime now and hey ho I got your blog. I was in St. Vincent about 26 years ago, so its quite interesting to see the developments. We are all very much the same here, a bit older a bit more feeble, but non the less still the people you left behind.